Anil Kumble led from the front to make a memorable captaincy debut as India scripted a six-wicket victory against Pakistan in the first Test at the Ferozeshah Kotla ground here today. 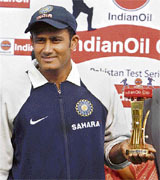 As an icing on the cake, Kumble was also given the man of the match award. In my last column on Day Three of the Kotla Test, I had said that it was a very tough match to call as both teams were equally poised in the game. Well, that was to change very quickly the following morning, and once India had edged their nose in front, they never gave Pakistan a chance. Emerging triumphant on his debut as India captain, veteran leg-spinner Anil Kumble today said the team performed well during crucial stages of the game and that proved decisive in clinching the opening cricket Test against Pakistan at Ferozeshah Kotla here. Former Pakistan captains today expressed anguish over the first Test defeat to India in New Delhi with Rameez Raja accusing some players of only playing to maintain their places in the team. New Delhi, November 26 Pakistan captain Shoaib Malik today attributed his team's loss in the first Test against India to the failure of batsmen to put up good score in both the innings. "We were 100 runs short in the second innings. That could have made the difference," Malik said after India won by six wickets and took 1-0 lead in the three-Test series. Pakistan coach Geoff Lawson believes his wards lost the battle of the middle orders against India, which eventually led to the side's six-wicket defeat against the hosts in the first cricket Test here today. An e-mail threatening to disrupt the second India-Pakistan Test, starting at the Eden Gardens here on November 30, and kill Pakistani players sent security forces into a tizzy tonight. Thanks to a century by Ravneet Ricky (111 not out) and a fine knock by debutant Charanjit Singh (64 off 109 balls), Punjab gained three points on the basis of their six-run first innings lead in the Ranji Trophy Super League match against Uttar Pradesh which ended in a draw at the PCA Stadium here today. Opener Gautam Gambhir enhanced his chances of a recall to the Indian Test squad with an unbeaten hundred as Delhi drew their four-day Ranji Trophy Super League tie against Mumbai here today. Asserting that cricket boards around the world could not bar players from earning a living through the Indian Cricket League, former Sri Lanka captain Marvan Atapattu said here today that the venture should be looked upon as an employment opportunity rather than a challenge to the existing set-up. 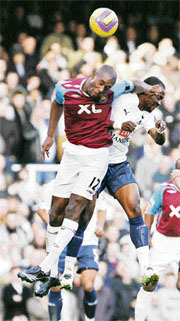 Tottenham had an injury-time penalty kick saved in a 1-1 draw against West Ham in the English Premier League. West Ham goalkeeper Robert Green dived to his left to save the shot from Jermain Defoe, who had earned the penalty after being brought down by Lucas Neill. Prime Minister Manmohan Singh today congratulated Dola Banerjee for winning the gold medal in the archery World Cup. In a statement, he said, “Dola has done the nation proud and has become an inspiration for up-and-coming archers. I wish her the very best in all her future endeavours,” he said. Dola had won the gold in the women’s individual recurve competition at the World Cup in Dubai on November 24, beating Eun Young Choi of Korea 110-109 in the final. New Delhi, November 26 Ritwik Bhattacharya won his seventh Professional Squash Association World Tour title when he defeated third-seeded Bilal Zaman of Pakistan in a marathon five-set battle in the fifth Malaysian National Sports Council Super Satellite No. 3 event in Kuala Lumpur today. Nike today kicked off its annual grassroots initiative for football in India - the Manchester United Premier Cup (MUPC) - India Final 2008, which will be conducted across India from November 28 to January 20. The boys teams of Chandigarh, Himachal Pradesh and Delhi and the girls teams of Punjab and Rajasthan won their preliminary matches on the inaugural day of the 53rd National School Games (under-19 handball) at the Guru Nanak Stadium here. National Football League runners-up JCT began their I-League campaign with a bang, defeating Mohun Bagan 2-1 in their opening match here today. While Eduardo, known as Edu, scored twice for the visitors, S Venkatesh pulled one back for the home team in the 92nd minute. The Delhi ground, where the 37-year-old leg-spinner had taken all the 10 wickets of the Pakistan second innings to win the Test and draw the series the last time they played here, yet again proved lucky for him. "Oh, yes. The ground has been very lucky for me", he said after the victory. "It's great to play at the Ferozeshah Kotla ground. I like the atmosphere here". "The boys responded well. Everybody contributed (for the victory)", he said in a cultured, composed tone. The captain said the triumph was something very satisfying for him personally "as it's nice to get back to the ground at my age and win, particularly when I had not played in the ODI series". India needed 32 runs with seven wickets in hand to clinch the Test, and the hosts got the runs in as many minutes off 6.2 overs today for the loss of Sourav Ganguly's wicket. India knocked in 203 for 4 off 61.1 overs in 293 minutes in their second innings to go one up in the three-Test series. The second Test will be played at the Eden Gardens in Kolkata (Nov. 30-Dec. 4) and the third Test in Bangalore. India, resuming at 171 for 3, lost Sourav without any addition to his overnight score of 48. Sachin Tendulkar, who took off from his unbeaten 32 in a blistering manner. He hooked the first ball of Shoaib Akhtar to fine leg for the first boundary of the day, took two more runs off the quickie to race to 37. Sachin pulled Sami's second ball of the very next over between deep square and long leg for another four. Most of his shots were pulls or hooks, but when Sourav attempted a similar shot off Shoaib, he could only hole out to Tanvir at long leg. Sourav and Sachin hoisted 88 runs for the fourth-wicket, off 23.5 overs. India needed 22 mores runs to win and Laxman pulled Sami for a boundary to open his account. But it was the ceaseless aggression of Sachin that stole the spotlight. He carted spinner Danish Kaneira to raise his 50 and cut Shoaib to a boundary past the backward point area to hoist the winnings runs. 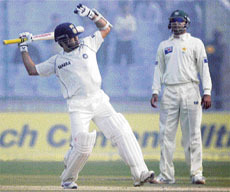 Sachin remained unbeaten on 56 (9x4, 109b, 168m) and Laxman on six. Laxman was adjudged the man of the match for his solid batting in the first innings while Shoaib got the best bowler award. Kumble was also all praise for Sachin's batting. "Sachin is really amazing. We started our career together, and I have seen him grow. He has handled pressure well. He has done that for the past 18 years. He adjusted to the demands of the game well", Kumble said. "Sourav's batting in the second innings was critical". Though the Indian captain was impressed with Shoaib's express bowling, he was not concerned about what impact he would have in the next two Tests. "No team revolve round on one individual. Shoaib bowled exceptionally well, but our batsmen were good to counter him", Kumble concluded. Fall of wickets: 1-2, 2-84, 3-93, 4-181. Bowling: Akhtar 18.1-4-58-4, Tanvir 12-4-26-0, Kaneria 16-2-50-0, Sami 15-1-65-0. The difference between these two teams clearly is down to two factors — professionalism and experience. Let me explain. This match, as so many India-Pakistan games tend to be, was a battle of nerves. Pakistan squandered the advantage of the toss but then played themselves back into the match with some very good bowling. But on the day they should have pressed home the advantage of leading by 170-odd runs and five wickets in hand, they just threw it away. The Indians, on the other hand, stuck to their task in a very professional manner. Everyone contributed his bit towards the overall effort and theirs was really a team effort. Pakistan, unfortunately, could not match them in this department and the fourth day collapse virtually handed over the match to India on a platter. Had they managed to put another 70-80 runs on the board, the match would have witnessed a much closer finish. The other factor is experience. Though most of the boys have been playing at the international level for a number of years, India had five seasoned professionals who in the end took the team home. Yes, every international side will have a few youngsters in the ranks — that is true of teams around the world — but Pakistan also had the likes of Mohammad Yousuf and Younis Khan to show the younger players the way. In this, they have failed the team. They did not lead the way. In contrast, every Indian senior did his bit. One reason for this is that unlike India, where almost every place has someone in reserve and pressing for a place, Pakistan are stuck with the same old faces. No one is really under pressure. They are all comfortable in the knowledge that even if they are out of the side for some time, they will be back pretty soon. The pool of available players is small, and has just not grown in the last few years. Another issue that faces Pakistan is the lack of performance from their captain. Shoaib Malik has not had a good tour and unless as a skipper you lead by example, the team tends to get the wrong signals. In the one match he scored runs, at Jaipur, Pakistan looked a very different side. Here in Delhi, he had a poor match with the bat and consequently, his body language was all wrong. He showed that he was under pressure and the rest of the team picked that up. The results were there for us to see. "It was not easy in last four days but we did crucial things at right time and handled the pressure well than Pakistan. I know they will try to come hard at us in the second Test," Kumble said after leading India to six-wicket win with almost a day to spare. Kumble, who was adjudged the man of the match for his seven-wicket haul on his happy hunting ground, gave credit to the entire team to outplay arch-rivals Pakistan. "It's great to start the series on winning note. The team performed well and congratulations to the boys and support staff. There was input from everyone and everybody contributed from start till the end. Sourav's (Ganguly) batting was crucial," he said. Kumble reserved his best compliments for Laxman and expressed dismay as to why he is always singled out for not performing. He said Laxman, together with Dhoni, brought them back into the game in the first innings. "Laxman's knock was very crucial. He is a fantastic player. I don't know why there is always a sword hanging on his head. It's really unfortunate. His partnership with (Mahendra Singh) Dhoni was crucial after we had let them (Pakistan) off the hook at 142-8 in their first innings. His knock brought us back in the match," he said. "He (Laxman) brings quality to the team and his role in the team is crucial," Kumble said about the stylish Hyderabadi batsman. He said his happy memories of Kotla inspired him to perform well. "I have always performed well here. It creates that kind of atmosphere in my mind. I have done well here since my Under-19 days." He said the collapse of Pakistan batting order in both the innings was a reflection of a good show by Indian bowlers, who created pressure with their economical bowling. "It was low and slow pitch. It was very dangerous... but I am happy we got them out inside 250 in both the innings. "We created that kind of pressure by suffocating them. Zaheer (Khan) bowled exceptionally well from both ends by producing reverse swing. The pressure we created, suffocating them by not giving runs, was critical on this wicket. When you know we need one wicket and that comes in the first over in the morning," he said. Kumble also rested faith on Dinesh Kaarthick, who failed as an opener in both the innings. Rameez said there was a need for radical steps to be taken to overhaul the Pakistan cricket system. "I just feel after watching the one-day series and the Test that a tendency of selfishness has crept into the performance of some players. They are only playing for themselves and not for the team," he said. "And until the players give priority to the team, the performances will not improve," he told the 'Express' newspaper. Rameez, who is in India as commentator, also alleged that there were some people in Pakistan cricket who had their own agendas and were not sincere about improving cricket in the country. Former players needed to be involved to scout out new talent, he said. "There is a dearth of good openers and bowlers in Pakistan. There is no doubt about that." Javed Miandad, who had also been national coach three times, lamented that the batsmen were just not playing Test cricket as it should be played. "There was nothing wrong with the Ferozeshah Kotla pitch. The players just needed to apply themselves and play patiently. It is shocking the way some of them got out. With this attitude how can you win matches at the top level," he questioned. The feeling of disappointment was also visible on the streets among cricket fans. Pakistan captain Shoaib Malik today attributed his team's loss in the first Test against India to the failure of batsmen to put up good score in both the innings. "We were 100 runs short in the second innings. That could have made the difference," Malik said after India won by six wickets and took 1-0 lead in the three-Test series. Malik, who went into the match with three seamer and only one specialist spinner on slow Kotla track, justified his decision, saying they required more runs and not extra spinner for a win. "We did not feel the need of another spinner in the side. (Danish) Kaneria picked four wickets in the first innings. In the second innings, we had 100 runs less and a spinner will take some time (for which there was no space)," he said after losing with almost a day to spare. "If we could have scored 300 in the second innings we could have won. We did not do well in batting department." A dejected Lawson pointed out that barring the glorious exception of Misbah-ul-Haq, the Pakistani middle order cut a sorry figure in the match, while their Indian counterparts came up with a solid show tilted the scale in the hosts' favour. The two page e-mail sent from yahoo.co.in was received by a private TV channel, which forwarded it to the Kolkata Police around 5 pm, police commissioner Goutam Mohan Chakraborty told PTI after a high-level meeting at the city police headquarters. The meeting was attended by joint police commissioners SN Sarkar, Zulfikar Hasan, Sudhir Mishra and Pradip Chatterjee, and deputy commissioners Vishal Garg and Vineet Goyel. The meeting took stock of the security system at the Eden Gardens and decided how to beef up the arrangements for the Test. Chasing a target of 352 on the final day, UP reached 230 for 5 when the two skippers decided to end the match nine overs before the scheduled close of play. Punjab now have seven points, while UP added just one to their seven-point tally. Earlier, Punjab’s overnight batsmen Ricky and Charanjit took the score from 238 for 7 to 334 for 8 to put the team in a safe position. The innings was declared at 351 for 9 by skipper Pankaj Dharmani. Surprisingly, UP captain Mohammad Kaif delayed taking the second new ball. Ricky slammed 14 boundaries during his ton, while Charanjit’s knock included 12 fours. Pacer Abid Khan claimed Charanjit’s wicket, whereas VRV Singh made 11 before falling to Piyush Chawla. UP began the chase shakily as pacer Manpreet Goni send back openers Rohit Srivastav and SS Shukla on consecutive balls when the total was 36. Playing a captain’s knock, Kaif stitched a 123-run partnership with T Srivastava for the third wicket. Kaif hit 71 off 100 balls, while Srivastava chipped in with 66 off 106 deliveries. Fall of wickets: 1-37, 2-48, 3-91, 4-92, 5-166, 6-192, 7-218, 8-334, 9-351. Bowling: Praveen Kumar 14-5-28-2, Sudeep Tyagi 24-4-97-1, Mohd Abid Khan 19-0-74-1, RP Srivastava 16-6-42-1, Piyush Chawla 30-9-75-4, SS Shukla 8-0-25-0. Fall of wickets: 1-36, 2-36, 3-164, 4-174, 5-203. Bowling: VRV Singh 15-1-82-1, Manpreet Goni 11-3-31-2, Birinder Singh 5-0-29-0, Charanjit Singh 15-1-63-2 Amjut Kakkar 5-0-21-0. Jammu: Jharkhand beat Jammu and Kashmir by 250 runs on the final day of their Ranji Trophy Plate League match here on Monday. Requiring 376 for victory, the hosts were bundled out for 125 in 58.4 overs. Jharkhand’s SS Rao and Santosh Lal took four wickets each. J&K (2nd innings): 125 (Arshad Bhatt 43, Kanvaljit Singh 25; SS Rao 4-32, Santosh Lal 4-48). “I don’t think ICL should be blocked in any way. In fact, we need more such initiatives to groom talent. It should be treated as a career chosen by a cricketer. Tottenham had an injury-time penalty kick saved in a 1-1 draw against West Ham in the English Premier League. West Ham goalkeeper Robert Green dived to his left to save the shot from Jermain Defoe, who had earned the penalty after being brought down by Lucas Neill. “It would have been harsh if we had lost in the last minute like that,” West Ham manager Alan Curbishley said. The save denied Tottenham their first away win of the season, but the club is still unbeaten in four games under manager Juande Ramos. Also yesterday, Blackburn twice rallied to draw 2-2 with Fulham. Spurs had equalised in the 67th minute when Michael Dawson headed a free kick from Jermaine Jenas over the approaching Green to score. “Green said sorry for the first goal because when you come for the ball you’ve got to come and get it, but what he did at the end of the game made up for it,” Curbishley said. Carlton Cole had put West Ham in the lead in the 20th minute. Luis Boa Morte started the move, crossing to Nolberto Solano, who then passed for Cole to score. Tottenham striker Robbie Keane claimed he should have been awarded a penalty kick in the 41st minute when he was tripped by the legs of Green when trying to run around him. Referee Mike Riley waved play on. Tottenham started goalkeeper Paul Robinson, who was dropped from the England squad for its 3-2 loss to Croatia on Wednesday. Robinson made a standout save from Boa Morte in the 26th minute and also saved a shot from Scott Parker in the 80th. Jenas cleared a header from George McCartney off the line in the 88th minute. West Ham have 19 points and are in 10th place, while Tottenham are in 14th place with 12 points. At Craven Cottage, Stephen Warnock scored Blackburn’s second equalising goal in the 79th minute off a cross from Jason Roberts. Fulham had led 2-1 with a close-range shot from Diomansy Kamara in the 63rd minute. Fulham scored first when Danny Murphy sent Blackburn goalkeeper Brad Friedel the wrong way from the penalty spot in the 51st minute. Kamara had earned the penalty after he was fouled by Ryan Nelsen. Blackburn levelled at 1-1 in the 57th with a goal from Brett Emerton, who controlled the ball with his chest and volleyed in a headed cross from Roberts. Blackburn stayed in ninth place with 23 points, while Fulham are 12th with 13 points. Prime Minister Manmohan Singh today congratulated Dola Banerjee for winning the gold medal in the archery World Cup. In a statement, he said, “Dola has done the nation proud and has become an inspiration for up-and-coming archers. I wish her the very best in all her future endeavours,” he said. Dola had won the gold in the women’s individual recurve competition at the World Cup in Dubai on November 24, beating Eun Young Choi of Korea 110-109 in the final. The Lok Sabha also congratulated the ace archer. “It is a matter of great pride and joy that Dola Banerjee has won the World Cup gold. Her victory has brought laurels to the country,” Speaker Somnath Chatterjee said in the House amid applause. Ritwik Bhattacharya won his seventh Professional Squash Association World Tour title when he defeated third-seeded Bilal Zaman of Pakistan in a marathon five-set battle in the fifth Malaysian National Sports Council Super Satellite No. 3 event in Kuala Lumpur today. Ritwik, who is sponsored by JCT and AIS, played three five-setters in the tournament, including the semifinal and the final. He defeated No. 3 ranked Malaysian Nafizwan Adnan in the semifinal. This is Ritwik’s first tour title after his recent knee injury which kept him out of competition for five months. The win will help him improve his ranking, which will be revised on December 1. His ranking fell from 38th to 72nd when he went out of action in August. This is the third year in a row that Nike is conducting this tournament in association with the All-India Football Federation (AIFF). Nike’s MUPC tournament has attracted participation of teams from Mumbai, Tamil Nadu, Bangalore, Orissa, Pondicherry, Kerala, Gujarat, Delhi, Chandigarh, Goa, Kolkata and the North-East. This year, over 50 teams from across the country are vying to be the Indian finalists. The competition is open to footballers under the age of 15. The past few years have attracted a cumulative participation of 9,00,000 players and 9,000 teams from over 40 countries, including England, France, Brazil, and Germany. The tournament has witnessed past winners of champion clubs such as Barcelona, Corinthians, Manchester City and Sao Paulo. “The winners of the India round will be flown to South-East Asia to participate in the South-East Asian regional finals of the tournament to be held in May, 2008,” said Sanjay Gangopadhyay, marketing director, Nike India. The tournament is being conducted under the aegis of the AIFF with the support of the Tamil Nadu Football Association, Chandigarh Football Association and Goa Football Association. The participating teams include East Bengal FC, Mohun Bagan AC, Mahindra United FC, JCT, Dindigul District Youth Academy, Pune FC, Viva Kerala, Salgaocar Sports Club and Sporting Clube de Goa. The group stage matches of the tournament will be held at two centres - South and West Zone (Chennai qualifier) at JN Stadium, Chennai, from November 28 to December 1. In the girls section, Punjab beat Himachal Pradesh 23-5, while Rajasthan defeated Chhattisgarh 18-13. In the boys category, Chandigarh defeated Gujarat 21-10, Himachal Pradesh beat Chhattisgarh 23-13 and Delhi outplayed Andhra Pradesh 25-10. About 400 players of 19 states, one Union Territory, one Navodya Vidyalaya and one Kendriya Vidyalaya are participating in the week-long games for under-19 boys and girls. Earlier, the games dedicated to Shaheed Bhagat Singh were declared open. Karamjit Kaur, Indu Bala, Satwinder Gora (all Maharaja Ranjit Singh awardees) and Balwinder Singh Rana lighted the games torch. 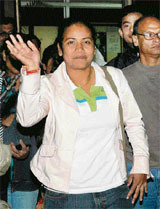 International player Ramanjeet Kaur took the oath on behalf of the participants. Speaking on the occasion, the Punjab education minister, Dr Upinderjit Kaur, said the state government would provide Rs 12.84 lakh for the promotion of school sports during the current year. The Brazilian striker drew first blood in the 14th minute, converting a direct free kick after Baljit Singh was brought down outside the 18-yard box. Edu’s curling right footer swung in and entered the net, leaving Bagan custodian Shilton Paul helpless. The visitors’ second goal came in the 75th minute from a brilliant combination set up by Gurwinder Singh and Baljit Saini. Shilton Paul rightly came out of the line to foil the Saini jab, but Edu was waiting to lap up the rebound.